The simple old Japanese tradition of water sprinkling - uchimizu - is an effective way of reducing extreme heat in cities. This will be TU Delft researcher Anna Solcerova's message at the EGU General Assembly (European Geosciences Union) in Vienna on Monday 24 April. It has long been known that, generally speaking, cities are hotter than the surrounding countryside; a phenomenon known as the 'Urban Heat Island' (UHI). Roads and buildings absorb and retain more solar radiation than the soil and vegetation found more prominently in the countryside. This causes the city to heat up more, an effect which is further reinforced by human activity such as heating and transport. 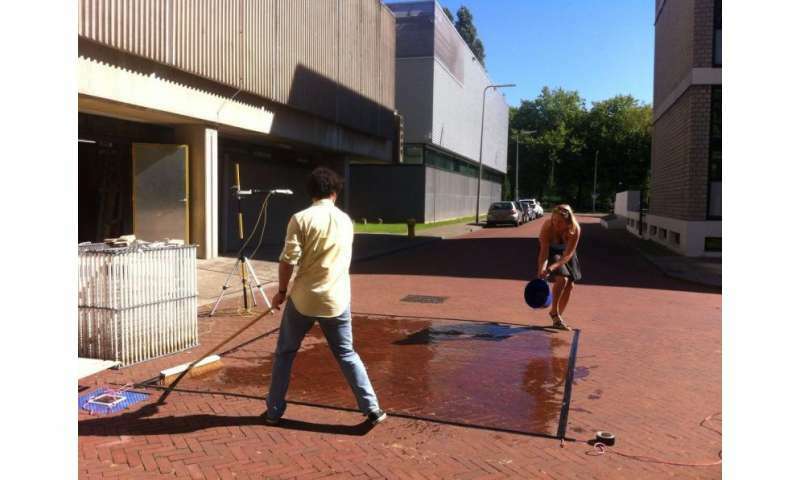 For this reason, this study, which is part of Anna Solcerova's PhD research, uses a 3-D Distributed Temperature Sensing (DTS) system to record extremely precisely (in space and time) the air temperature in one specific cubic metre of air above a pavement in a city. Solcerova and her colleague Tim van Emmerik tested this system using a large cube with fibre optic cables (designed by Van Emmerik and TU Delft colleague Koen Hilgersom) that measure the temperature. They poured water around and under the cube; first 1 mm, then 2 mm, and so on. Hottest on record in a city of 5 million people. Comparing this Hottest on record temp to temperatures in the same location 150 years ago is pointless because of the Urban Heat Island effect..